Apple has released macOS Mojave (versioned as MacOS 10.14) for all Mac users with a Mojave compatible Mac. MacOS Mojave includes an all new Dark Mode theme for the general interface, desktop Stacks to help declutter a desktop, new screenshot tools and capabilities, a variety of improvements to Finder, the inclusion of several new apps from the iOS world like Stocks and Voice Memos, a redesigned Mac App Store experience, Dynamic Desktop which slowly changes the wallpaper throughout the day, along with various other new features and refinements. 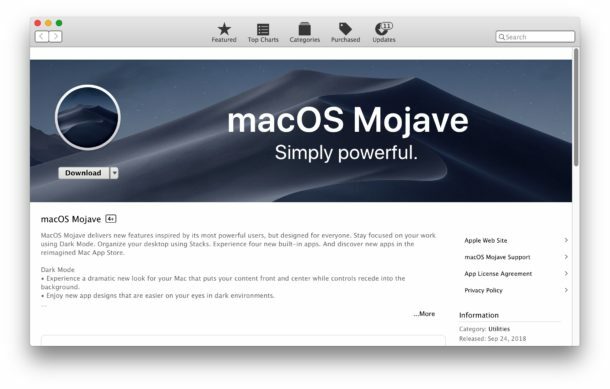 Anyone can download MacOS Mojave now for free from the Mac App Store, the software update will install on any computer found on this list of Macs with support for MacOS Mojave, which is basically any Mac built after mid-2012. The installer is around 5.7 GB to download from the Mac App Store. When you finish downloading macOS Mojave from the Mac App Store, the installer will launch automatically to try and run the software update. However, you do not need to run the installer right away, so if you want to make a copy of the installer file for use on another Mac or for other purposes it’s a good idea to do that right after downloading (remember, macOS installer applications will delete themselves after successfully running). If you wish to create a bootable USB installer for macOS Mojave or make a copy of the installer file for backup or for using on other Macs without them having to download the installer, you should immediately quit out of the installer to do so. It is strongly recommended to backup a Mac before installing any system software update, the easiest way to do so for most Mac users is to setup and use Time Machine for backing up a Mac, which uses an external hard drive to store backups of the Mac and all user data. Failure to perform an adequate backup could result in permanent data loss. 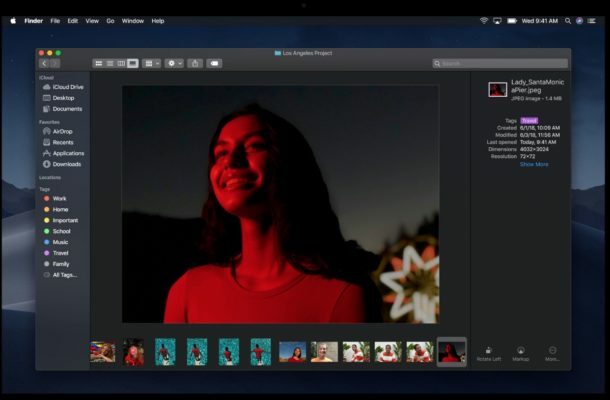 Some features new to macOS Mojave, like Continuity Camera which allows you to use your iOS devices camera to quickly snap photo into a Mac app, require iOS 12 to be installed on the associated iPhone or iPad. Many Mac users will update to macOS Mojave right away, while some others may wait for a later update to Mojave (for example, a future update like macOS Mojave 10.14.1 or macOS Mojave 10.14.3). If you’re curious about MacOS Mojave but don’t yet want to commit to running it as your full time operating system, you can run macOS Mojave in a virtual machine like Parallels as described here, which allows you to experiment with the latest Mac OS version without impacting your main operating system. Are you going to download and install macOS Mojave right away? Or are you going to wait to install it later? Share your thoughts, experiences, and opinions in the comments below! For those on the beta’s, the last was 18A389 on my Mac. So this is a change from the last beta. Also, without removing the Beta profile, you will need to use the link in the App store. JR posted it below. One more tidbit: Boot camp not supported on macOS Mojave for 2012 iMacs. Mojave install will require ditching the boot camp partition and losing the windows installation. Then you update with the installer like any other. And yes you can make a USB installer from that installer file. Thanks, these were my questions…. Good luck everyone, we all counting on you! You know what’s funny about using an external hard disk drive to backup a solid state drive? My backup drive just crashed and it’s taking forever to recover. Looks like it’s time to move to an SSD backup. There’s a slight problem – when downloading the install file from the app store, the file is only 22 MB instead of the 5,7 GB it should have. How can you download the ACTUAL 5,7 GB file? If you are downloading the little mini installer (which then downloads the full installer into /tmp directories, annoying!!!) then the only workaround I know is to use an app to download the full installer. Previously I used that method for downloading the full size version of macOS installer and it worked. I downloaded and installed Mojave via the App Store, but when my computer restarted, all my applications had disappeared. The only apps on the hard drive were Apple’s software, so I have reinstalled High Sierra via a Time Machine backup. Can somebody tell me, please, how to install Mojave on my Mac, whilst keeping all my own third-party applications on the drive. I think by accepting 3rd party app in the security prefences under the general tab. As for me and upgrading, my g5 iPad wont sync with el cap anymore and i hate all sierras, so I’m going back to mountain lion as we speak or buy an HP LAPLET. The problem with your original syntax was the “Install\ macOS\ Mojave.app” portion, which was still referencing the beta release rather than final. That should work! I followed all directions to make a bootable flash drive. And I get the message sudo: /Applications/Install macOS Mojave Beta.app/Contents/Resources/createinstallmedia: command not found. Whether 6.04GB or 5.7GB this is more than many peoples data allowance for a month!! Apple never state the size of their files with data size, until download starts, why do they do this is beyond me? If you look it up on the App Store, it does say 5.7 GB on the download page. Installed Mojave on my MacBooc pro without any problems. Everything working smart so far. Update on my iMac is just in progress. 1. On 2012 iMacs, boot camp is not supported and Apple has officially acknowledged this fact. Therefore, anyone who needs to keep a Windows bootcamp installation on a 2012 iMac should NOT install MacOS Mojave. 2. Starting in MacOS Mojave, a user password is required (i.e., hitting enter to log in is disabled) to be able to log in. Therefore, anyone running an earlier version of MacOS without a user password (i.e., anyone who just hits enter to log in) should set one before updating to macOS Mojave. Installer does not start automatically after downloading is finished. What now ? Do you know where I can get a copy of OS Sierra or High Sierra? I don’t have a copy of it, and Mojave is having issues with Flash. You can re-download High Sierra from the Mac App Store even from MacOS Mojave. But if you are using Flash, you might try to download and use Chrome web browser. Chrome has a sandboxed up to date Flash plugin that works well. Don’t try to install Flash in Safari, it does not work well in my experience.